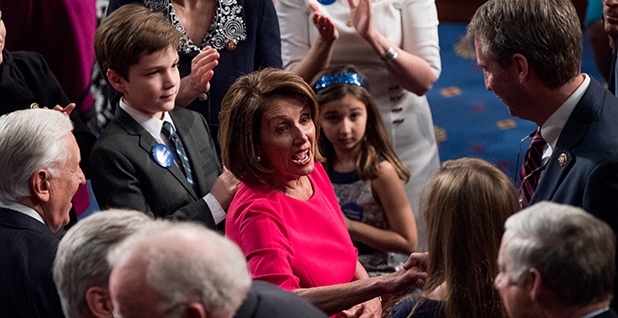 House Democrats began plotting their course on climate change from the drop of the gavel yesterday, promising to make it one of the marquee goals of the new Congress despite internal divisions on the issue. Central to that effort will be the new Select Committee on the Climate Crisis, which was formed as part of the first House rules package passed last night. Rep. Kathy Castor (D-Fla.), tapped by Speaker Nancy Pelosi (D-Calif.) to lead the panel, said any outstanding concerns that standing committee chairmen had about jurisdiction have now been settled. "I believe we are unified moving forward," she told reporters yesterday. "Once a decision is made, it's made, and we've got to move on." The question now is what role the select committee will play in shaping the Democratic climate agenda in the new Congress and moving toward the 2020 presidential election. With pressure from progressives, Democrats appear poised to put an even bigger emphasis on climate than in the past, particularly on the conventional standing committees. Energy and Commerce Chairman Frank Pallone (D-N.J.), a vocal critic of the select committee, announced yesterday that his panel's first hearing in the new Congress will be to assess the environmental and economic impacts of climate change. The select committee, meanwhile, will be a messaging platform of its own, and members and aides have suggested that the nine spots on the Democratic side will be populated by freshmen and more junior members who would otherwise want a spot on E&C. Castor said the rosters, which will ultimately be selected by Pelosi, have not yet been finalized. But she said she thinks Rep. Alexandria Ocasio-Cortez (D-N.Y.) should get a slot. Ocasio-Cortez was the key voice behind the progressive push for a "Select Committee on a Green New Deal," which would have been tasked with developing a sweeping climate change bill by 2020. But Pelosi opted for a weaker version of the panel, without legislative authority or subpoena power. Castor said she pushed Pelosi to include those authorities, though she noted that the last Select Committee on Energy Independence and Global Warming, led by then-Rep. Ed Markey (D-Mass. ), only issued one subpoena. Either way, both Castor and some more progressive lawmakers suggested yesterday that the select committee could still be a venue for developing the "Green New Deal," a nebulous set of proposals to transition the country to 100 percent renewable energy in a decade. "The Select Committee on the Climate Crisis is an initiative in the spirit of the new green deal," Castor said. "Now, the difficult part is taking that general framework and turning it into policy, turning it into law, turning it into appropriations, the right kind of investments." Rules Chairman Jim McGovern (D-Mass. ), who helped write the language that authorizes the select committee, suggested that what gets done will be less about mandate and more about who's on the committee and how they work with the committees of jurisdiction. "You want to get good people on that committee who are going to think in a bold and forward way," he said. "Let's make it work." Castor said she intends to hold joint hearings with other committees as well as field hearings to highlight local efforts to combat climate change. That, she said, could help persuade conservatives skeptical of climate science to play ball on the select committee. "There are Republican and conservative communities that have invested in renewables, that are leaving fossil fuels behind, investing in wind energy and solar energy," Castor said. "So we're going to shine the spotlight on them and maybe do a little shaming of areas that are acting in a dirty, anachronistic manner." Incoming E&C Subcommittee on Environment Chairman Paul Tonko (D-N.Y.) said he would be open to joint hearings, as did Transportation and Infrastructure Chairman Peter DeFazio (D-Ore.). DeFazio said it would take some of the pressure off his committee, ticking off a laundry list of policy priorities, including a major transportation infrastructure bill, a water infrastructure bill, a pipeline safety bill and other efforts to reduce fossil fuel consumption in the transportation sector. DeFazio added there are plenty of issues tangentially related to transportation — such as improving battery technology and fuel cells — for the select committee to hold hearings on. "There's a lot of things outside my jurisdiction that relate to transportation that I would be happy to have this committee hold hearings on," he told reporters yesterday. "It's a big task." Smaller details of the select committee are still being worked out. Natural Resources Chairman Raúl Grijalva (D-Ariz.) said leadership committed not to dock standing committee budgets to pay for the select panel, and Castor said the money was still under discussion. Ocasio-Cortez and other progressives also pushed for members who serve on the select committee not to take contributions from fossil fuel companies. Castor rankled progressive groups last month by suggesting that would be against the "First Amendment," though she has since personally committed to stop accepting fossil fuel contributions. As for other members of the committee, Castor said, "We'll see. "I think we're going to have probably more discussions in the caucus," she added. There will be six spots for Republicans on the select committee, and a few have already stepped up with interest in the dais. Rep. Jim Sensenbrenner (R-Wis.), who was ranking member of the last select committee under Markey, "is interested in serving as ranking member and has reached out to leadership regarding the matter," said spokesman Christopher Krepich. Sensenbrenner is a longtime climate skeptic who cheered the Trump administration's withdrawal from the Paris climate accord. Rep. Francis Rooney (R-Fla.) also said yesterday that he had talked to House Minority Leader Kevin McCarthy (R-Calif.) about serving on the panel or even taking the ranking member spot. Rooney could also be in line to co-chair the Climate Solutions Caucus and is the co-sponsor of a bipartisan carbon tax bill. "I want to do all that I can do in the time I'm here to push a carbon tax, to push banning offshore drilling in the eastern Gulf and to raise awareness of the threat of sea-level rise to all coastal communities," Rooney told E&E News yesterday. "There may be some other things [Democrats] want to do that might be a little too far for me, but with those things I think we are on solid ground." Other Republicans, including the former chairman of the Energy and Commerce Subcommittee on Environment, John Shimkus of Illinois, had no interest. "I am busy enough," Rep. Fred Upton (R-Mich.) said when asked about serving on the panel. It's unclear whether McCarthy will appoint members who are interested in addressing climate change or skeptics who will try to counter Democrats on the issue. But compared with the other side of the aisle, the interest levels are weak. "It's a little lonely being where I am on the environment as a Republican," Rooney said. Reporters Jeremy Dillon and George Cahlink contributed.